Anatomically speaking Europeans don't look like that either. But most of the people look more European than Japanese, at least it seems to me ... Maybe it's the round eyes? And the non-black hair in some cases? Just like @senshin stated in his comment, for the Japanese people, their characters do look Asian. Why do the Japanese draw themselves as white? You see that especially in manga and anime. As it turns out, that is an American opinion, not a Japanese one. The Japanese see anime characters as being Japanese. It is Americans who think they are white. Why? Because to them white is the Default Human Being. Americans apply this thinking to Japanese drawings. But to the Japanese the Default Human Being is Japanese! So they feel no need to make their characters “look Asian”. They just have to make them look like people and everyone in Japan will assume they are Japanese – no matter how improbable their physical appearance. In your question, you also said "Maybe it's the round eyes? And the non-black hair in some cases?" [...] the Default Human Being thing is so strong that lacking other clear, stereotyped signs of being either black or Asian she defaults to white. huge round eyes – no one looks like that, not even white people (even though that style of drawing eyes does go back to Betty Boop). yellow hair – but they also have blue hair and green hair and all the rest. Therefore, hair colour is not about being true to life. small noses – compared to the rest of the world whites have long noses that stick out. white skin – but many Japanese have skin just as pale and white as most White Americans. Of course, there are also exceptions. A nice example is indeed Dan Eagleman, as stated by @senshin. The moment they need to make somebody look non-Japanese, they will try to design the character more to the American/European stereotype, i.e. 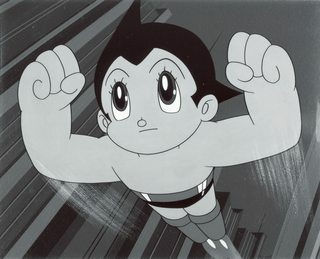 Astroboy started off as a show targeted mostly towards the Japanese, but soon Tezuka realised that it would not strike a profit on this alone. 52 episodes were sold to NBC Enterprises (as opposed to NBC Network), who in turn distributed the show to several places throughout America. Because of the US's different perspective of what is and is not acceptable for broadcasting on television, several episodes were not broadcast in the States - one of these includes a plot device where a message is held inside the eyeball of a statue of Jesus. Because the US's involvement was critical for Astroboy's success, Osamu Tezuka & his company Tezuka Productions Ltd. had to take this into consideration in later episodes that they produced. 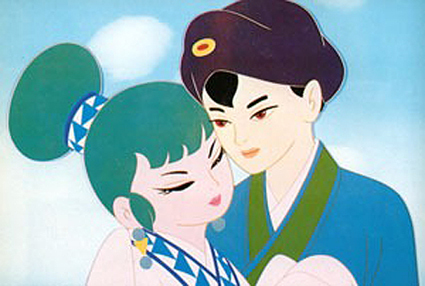 Now that the US were a recognised target audience of the show whom had influence on its production, Tezuka advised production to make the show denationalized - that is, they started to include signs in English, removing 'openly Japanese elements' and overall, making the show more accessible to both local and foreign sales. Also, in the early days of anime, smaller Japanese studios were always competing with the large US giants such as Disney. As a result, Japanese animation was greatly influenced by them - Tezuka's style (along with many other mangaka's of this era) was quite Disney-like, subconsciously affected by the studio's large successes. 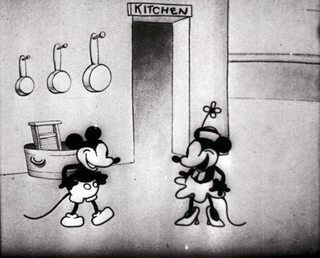 Disney's productions themselves were quite denationalized, some series more so than others, but American viewers did not have to experience a large stylistic change when watching Japanese cartoons - and for the most part, they usually assumed they were American. "We don't plan to advertise the fact that the series is being animated in Japan. We're not going to deny it, if anybody asks, but we're not going to publicize it, either. First of all, there are probably some buyers at stations out there who still haven't gotten over the fact that Japan was our enemy in World War Two. Second, if a buyer hears that the show is of Japanese origin, he's going to think it must be cheap [...]"
This isn't the only show to have these concerns however. Denationalization is a significant part of anime history as Japanese studios were always competing with their American counterparts, whose animation was higher quality and cheaper to import than produce locally. The more generic a character, the more one can associate with them, and by choosing a neutral coloured skin tone, more of the audience will associate with it. As a counter example, an animated movie in which Eastern traits were desired was The tale of the white serpent. As you can see below, the design of the characters were more oriental. Anyway, denationalization has become the norm and only shows which seek to emphasize Eastern design include it. Anime evolved with this feature in mind, and as other people have pointed out - audiences will always try to associate with characters in media, whether that be books, anime, film, etc. So, what may look European/American to you, may look equally Asian to those residing there because of the general design of the characters. There's a huge diversity of faces among Japanese people. Cartoon characters are hugely simplified, such that you can only typically identify ethnicity of a character if they're drawn to have stereotypical features. But why should Japanese people draw only stereotypical Asian features on characters in a show 100% intended for a Japanese audience? Generally, it is intended for people to assume the characters are Japanese unless stated otherwise. 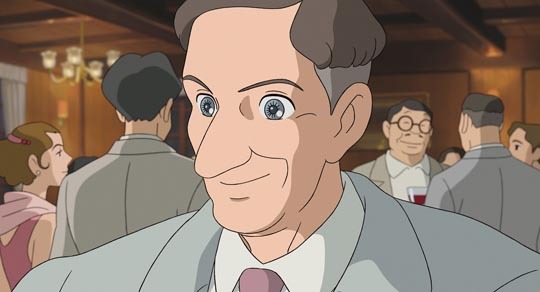 They only try to distinguish ethnicity in their character designs when the character is not Japanese, and then they tend to draw very stereotypical features. From examples like that, you can also tell that Japanese people have a very different idea of what a stereotypical caucasian looks like too. They tend to draw at least the men with clefted chins, square jaws, prominent cheekbones, wide mouths. 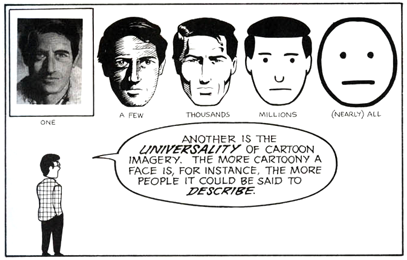 Sort of like how we draw stereotypical superhero faces, really. Their facial structure looks Asian, and their hairstyles are more in the style of Asian fashions (well, most Asian can pull it off since they tend to have younger looking faces). Their hair color comes in all ranges so that doesn't count. To be honest, in most animated Western movies, characters don't look like the average American to me; rather, it's their mannerisms that makes them look American. I was watching Tangled and I noticed that her eyes are very big, to the point where no one can have eyes that big, but minus the big eyes and her mannerisms, yes she comes across as western to me. That applies to most anime, their eyes are impossibly big for a human being, but minus their non-human eyes, I see lots of Asian features in there, and their mannerism makes it more obvious. Take Final Fantasy VII: Advent Children for example. Most characters, like Cloud (minus blue eye and blond hair), look like Gackt, who is Japanese, to me. And Tifa looks very Japanese. the first time I ever saw a Final Fantasy 7 Crisis Core/Advent Children cut scene, I thought they look very Japanese/anime aesthetic, and I haven't watched much anime at the time as well. You can argue that they look Eurasian more than pure European. And anime looks out of this world, but with some Asian aesthetic. That's my conclusion. So I disagree; they don't look European. They look Japanese and I accept it as that. White skin as opposed to Japanese toned. Round eyes as opposed to Japanese shaped, blonde/red/brown hair as opposed to black, and Caucasian face shape as opposed to Asian shaped. Even though I grew up in Canada, I still don't think "white" is the default human to me. I don't believe Japanese see Japanese people either, unless the character is Tenchi or one of his friends or something. As the top answers have already stated, the characters do look Asian from the point of view of the artists, but I want to add that Japanese people (and other Asian nations) have a fascination with white skin. The linked article gives an overview of the phenomenon. Pale skin is seen as an ideal trait that many young women strive for. Its origin is not in trying to appear more Western or European, but rather has a history in economic status, where field workers who were out in the sun all day would have much darker skin than the aristocrats staying in the shade. Today, it is manifested as an unrealistic beauty standard for women, not unlike the ones in the United States and other countries. How this relates to anime is that artists typically enjoy drawing beautiful people, unless they are concerned with realism (which, let's face it, most anime is not). In this case, that means having pale skin. If you look at the Japanese subcultures, they like to dye their hair in different colors to defy the norm, which are largely dark hair, not trying to look caucasian. I hear people claim that anime looks caucasian/europe makes me sad, as it shows how limited their world view is... Not all Asian has small squinty eyes, I've known a lot of friends who has round and big eyes, there are even more if you go to Asian countries. It's like saying those Causcasians who like to tan their skin are trying to be African American, or those who like to dance hip hop or rap are trying to be African American, but are they? Maybe some of them are, but most of them tan their skin because they think it looks nice with their overall eyes and hair, just like Asian/Japanese dye their hair because they think it looks nice with their complexion, and that is reflected in anime with different hair colors etc. I believe the Japanese were/are highly influenced by western and American culture. So to avoid looking like someone or as a self-hating country as a whole, they say they think that's how the average Japanese person looks instead of 'I like the way whites look.' This is just my opinion, but I see that it could also very much be a fact because if the Japanese see the characters as "Japanese" why just draw them the way we usually see them? Why not with dark skin, or different features? Features we usually see in other cultures. Wanna know why that's usual? Because they don't like it, and don't. See the beauty in it and don't want to be or look like it. I agree that in Aku no Hana they actually do look Japanese. Let's face it, we all know that Japanese, Chinese, and Korean have small, almost squinty eyes. White people don't necessarily have big eyes either, but they're bigger than the ones a typical Asian would have. Some say that the Japanese are trying to take over the world by drawing their characters as Caucasians. 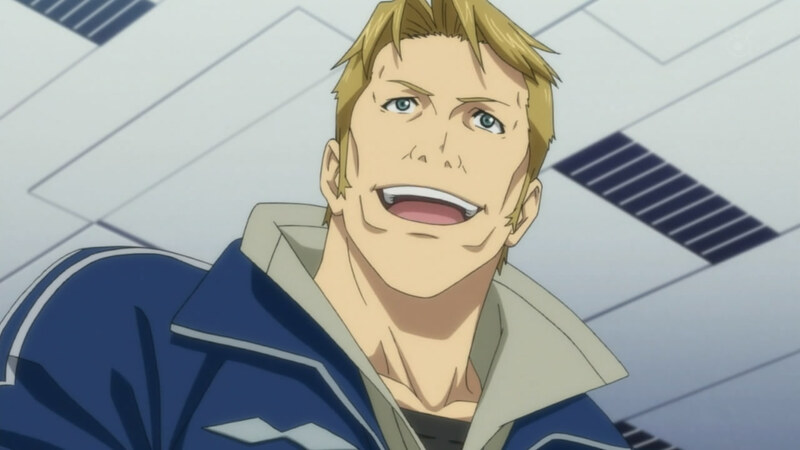 I have noticed that in animes the major characters are always white. It's very rare to even have an African character pop up every now and then as a on the side character, but that's about the most culture variation you'll see. Religion doesn't pop up either in animes, with the exception of the monks, and statues of Buddha that appear(only Japanese culture is allowed in JAPANESE anime and manga of course). And my point on religion and the appearances of the characters is that not every one has the same way of life or is comfortable wearing mini skirts. In a lot of religions they're not allowed to do some of those things that people on animes do. Like dating, flirting, going all the way before marriage, or even as a girl showing your thighs to another girl is not allowed. So, in the anime world every one is actually the same, even though the main character is usually some what different from the others, but in a way that we can't relate to because it's usually impossible IRL. Like in the anime series Naruto, he (Naruto) starts out as an out cast because of the fox demon sealed inside him. Therefore, treated differently by his peers in a negative way. The thing about hair colour, well, Asians almost always have black hair. On the other hand, Europeans are more often found with hair that is red. But, I read that that it is possible for Asian and African people to inherit the two copies of a recessive gene on chromosome 16 which causes a mutation in the MC1R protein(causes red hair). Considering the facts, most red heads have European genes, which is why people on animes that have red hair or even blond hair with blue eyes AND white skin, look like white people. But when characters have randomly crazy, awesome and impossible IRL hair colours like BLUE, GREEN, PURPLE, PINK, TURQUOISE, etc. you know it's just part of the illustrators' design. Why was One Piece white washed? Why is most anime centered on fighting? Why does the OP and ED of most animes use different art styles than the show? What was the first anime to have a “please notice me senpai” moment?